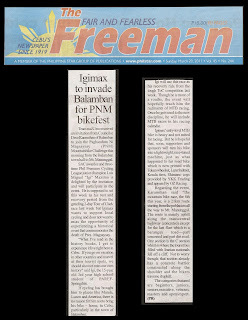 CEBU, Philippines - Team maX1mo received an invitation from Councilor Dave Karamihan of Balamban to join the Paghandum Ni Magsaysay (PNM) Mountainbike Challenge this morning from the Balamban town hall to Mt. Manunggal. SAC awardee and three-time Phil Premiere Cycling League junior champion Luis Miguel “Igi” Maximo is delighted by the invitation and will participate in the event. 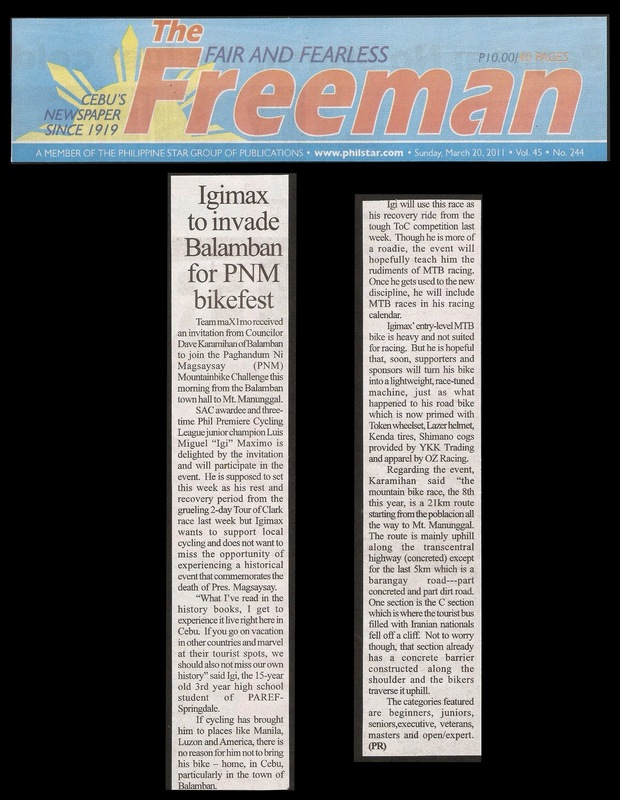 He is supposed to set this week as his rest and recovery period from the grueling 2-day Tour of Clark race last week but Igimax wants to support local cycling and does not want to miss the opportunity of experiencing a historical event that commemorates the death of Pres. Magsaysay. “What I’ve read in the history books, I get to experience it live right here in Cebu. If you go on vacation in other countries and marvel at their tourist spots, we should also not miss our own history” said Igi, the 15-year old 3rd year high school student of PAREF-Springdale. If cycling has brought him to places like Manila, Luzon and America, there is no reason for him not to bring his bike – home, in Cebu, particularly in the town of Balamban. Igi will use this race as his recovery ride from the tough ToC competition last week. Though he is more of a roadie, the event will hopefully teach him the rudiments of MTB racing. Once he gets used to the new discipline, he will include MTB races in his racing calendar. Igimax’ entry-level MTB bike is heavy and not suited for racing. But he is hopeful that, soon, supporters and sponsors will turn his bike into a lightweight, race-tuned machine, just as what happened to his road bike which is now primed with Token wheelset, Lazer helmet, Kenda tires, Shimano cogs provided by YKK Trading and apparel by OZ Racing. Regarding the event, Karamihan said “the mountain bike race, the 8th this year, is a 21km route starting from the poblacion all the way to Mt. Manunggal. The route is mainly uphill along the transcentral highway (concreted) except for the last 5km which is a barangay road---part concreted and part dirt road. One section is the C section which is where the tourist bus filled with Iranian nationals fell off a cliff. Not to worry though, that section already has a concrete barrier constructed along the shoulder and the bikers traverse it uphill.